Contributors to the Music Journal. Dr Graham Strahle is Music Australia’s Senior Writer and Editor of Music Journal. An experienced music journalist, he writes regularly for The Australian and The Adelaide Review, and has contributed to Limelight and Artstate Magazines, UK publications The Works and Managing the Arts Worldwide. Graham is a former Music Australia Councillor (2002 to 2009), served on the Music Australia Board (2002-2004), and has been a regular contributor to Music Forum. Graham is an editor at Journal of Music Research Online, holds a PhD in Historical Musicology, and plays the Viola da Gamba in various ensembles including Adelaide Baroque. Chris Bowen was CEO of Music Australia from 2013 - 2017. Chris has been Director Dance and Music at Arts Queensland, General Manager of two arts centres – The Judith Wright Centre of Contemporary Arts and Brisbane Powerhouse, and Director of Brisbane Multicultural Arts Centre where he gained a lifelong passion for world music. He is involved in small musical activities in Brisbane’s Samford Valley. Clare Kenny is Program Manager of Education at Music Australia. She has a great passion for education and the performing arts. Clare previously worked at Gondwana Choirs as Manager of the Sydney Children’s Choir and is a vocal tutor at The Arts Unit. Clare loves singing and music has been part of her life since a very young age. She performs with some of Sydney’s finest ensembles including Sydney Philharmonia Choirs, Gondwana Chorale, The Parsons Affayre and Cantillation. Maeve Marsden is a writer, director, producer and performer. As an opinion writer, her work has appeared in Daily Life, The Guardian, Junkee, ABC Online, SBS Online, ArtsHub, Daily Review and Gay News Network. Maeve also produces live music events with her company, blackcat productions, and performs in cabaret act, Lady Sings it Better. Cara Anderson is Marketing and Program Manager for Music Australia. She has a background in strategic marketing and relationship management with over 10 years’ experience in both corporate and not for profit roles with companies such as Opera Australia, version 1.0, Business Events Sydney and Thomson Reuters. Cara is passionate about making the arts accessible to everyone. Andy’s childhood dream of being a performer led her to work in the Arts and develop her passion for live performance. Andy has worked with various arts organisations and was previously Marketing Manager at Arts on Tour NSW and executive coordinator for the INAPAC (NSW & ACT Performing Arts Centres) Marketing Managers network. When not at work, Andy sings in a choir and likes to get out to see live music. Jim is the Music Education Campaign Manager for Music: Count Us In. As a member of the ARIA award winning band Art vs Science Jim has spent the past 10 years touring and playing music festivals across Australia and the world. He also holds his Commercial Pilot’s License and is a professional drone pilot in his spare time. He is passionate about music education and believes firmly in the positive power of music to change young lives. Rhonda is an expert in the field of early childhood education, television and music. Rhonda has a Masters of Music Education, a BA in Music Education and in 2008 she was Queensland University of Technology’s ‘Faculty of Education Outstanding Alumni’ award winner. Rhonda has taught more than 20,000 children and established dynamic Queensland group Viva La Musica. She composed music for the 2004 Athens Olympics and her orchestra performed for the Warner Brothers Great Outback Spectacular. Rhonda is internationally recognised for her consultancy work and is sought after as a keynote speaker throughout the world. She has advised the governments of Singapore, China and Hong Kong in music education and written curriculum for Queensland and Victoria. She is currently the Education Consultant and Corporate Trainer for P and O Australia. Rhonda is also currently a music specialist at Pullenvale SS and Early Childhood Consultant, Composer and Live pianist for Network Tens hit kids show ” Crocamole”. Tony Mitchell is an honorary research associate in cultural studies and popular music at the University of Technology, Sydney. He is the editor of Global Noise: Rap and Hip hop outside the USA (Wesleyan University Press: 2001). He co-edited Sounds of Then, Sounds of Now: Popular Music in Australia (Australian Clearing House for Youth Studies: 2008), and Home, Land and Sea: Situating Popular Music in Aotearoa New Zealand (Auckland: Pearson Education: 2011). D L Lewis lectures in academic studies at the Australian Institute of Music. His lecturing interests are popular music, roots music and popular culture. He is also a mandolinist, guitarist and bassist in various bands with a musical experience spreading over 20 years. Guy Noble is one of Australia’s most versatile conductors and musical entertainers, conducting and presenting concerts with all the major Australian orchestras and performers such as The Beach Boys, Yvonne Kenny, David Hobson, Ben Folds, Dianne Reeves, Randy Newman and Clive James. He has cooked on stage with Maggie Beer and Simon Bryant, appeared as Darth Vader, and might be the only person to have ever sung the Ghostbusters theme live on stage accompanied by The Whitlams. Guy is a regular guest presenter on ABC Classic FM, writes a column for Limelight Magazine and presents the inflight classical channels on Qantas, Air China, China Airlines and Gulf Air. Chris Rooney is a musician and educator working for Dabbledoo Music. Dabbledoo was set up in Ireland in 2011 and is focused on making learning music fun and engaging for primary school children throughout the world. Chris started playing the trombone at the age of 11 and went on to complete his diploma in music teaching and performance at the Royal Irish Academy of Music. He has toured and performed with numerous groups throughout Europe, USA, Australia and China playing in venues and festivals such as Carnegie Hall, Royal Albert Hall, Glastonbury Music Festival and the Port Fairy Folk Festival. Chris is currently based in Sydney and has lead the launch of Dabbledoo's music curriculum for Australian primary schools which is available at australia.dabbledoomusic.com. Phil Graham is Professor and Head of Music at QUT. He spent over two decades as a professional musician prior to entering academia. His research interests include music industry, music production, political economy, and discourse analysis. Lars Brandle is an experienced music industry journalist who has worked on three Continents. He’s the Australian correspondent for U.S.-based music industry “bible” Billboard Magazine and for the European live music publication IQ. Closer to home, his expertise on the global music business has been published in the Australian Financial Review, Business Review Weekly, Mediaweek and FasterLouder, and he’s a regular on ABC radio. He’s also a columnist with Sydney’s The Music Network. Lars was the long-time global news editor based in Billboard’s former London bureau, and he has spoken at conferences around the world, including MIDEM in Cannes, the Amsterdam Dance Event and the Popkomm in Berlin. Professor Dawn Bennett is Distinguished Research Fellow and Director of the Creative Workforce Initiative with Curtin University, Australia. Her recent research has focused on identity development, employability, graduate transition and creative labour markets, with a particular focus on the impact of identity development on higher education learning. A violist, Dawn serves numerous editorial boards and convenes the Australian Learning and Teaching Fellows’ network. She is on the board of directors for the International Society for Music Education and Music Australia, co-chairs the Music Australia industry and careers advisory group, and serves as a commissioner with the ISME Commission for Education of the Professional Musician. Associate Professor Shane Homan teaches in the School of Media, Film and Journalism at Monash University, Melbourne. He has co-authored two books with Martin Cloonan (Glasgow University) and Jennifer Cattermole (Otago University) for publication by Routledge in 2015: Popular Music and Cultural Policy; and Popular Music Industries and the State. Thomas Reiner is a composer of highly engaging music that is concerned with questions of meaning, emotion, symbols, musical time, human existence and artistic freedom in a postmodern world. Recently he completed a three-movement work for large orchestra, soprano and Flugelhorn about the work of French psychoanalyst Jacques Lacan. In 2014 his multimedia work Flayed Identities, which focusses on the involvement of Aboriginal soldiers in Australia’s wars, was performed at the Lake Bolac Eel Festival in Victoria. Alistair Noble refers to Reiner’s lasted recording, Semblances, as an “intelligent exploration of music thinking, of theoretical knowledge carried lightly, of thoughtful humanity and generous engagement”. David Mayocchi has worked in the arts and education sector in Brisbane since the 1990s. He is currently Executive Officer in the Faculty of Humanities and Social Sciences at the University Of Queensland, School Of Music and has written reviews for a range of publications. Dr Timothy McKenry is a music researcher, composer and pedagogue. His research interests include issues of ethics in music, Australian art music and cultural identity, music pedagogy and music theory. Recent research projects include studies of the pedagogical inheritance that informs the teaching of composition in Australian secondary and tertiary institutions, a major survey of contemporary Australian opera and a study of the ethical practices that inform music practice in Australia. He is a nationally-recognised expert in the area of music language study and composer training and has written syllabi for state and national examining bodies. He helped embed composition in the Victorian Certificate of Education and has undertaken a leadership role in fostering best-practice pedagogy in the study of music language study across Australia through research, teacher training, publication and advocacy of the discipline. As a composer, Timothy McKenry receives regular commissions, the latest being a piece for Soprano and mixed ensemble for the Bridges Collective – a work that has toured internationally. Other recent commissions include a choral setting of the Dylan Thomas poem 'Do Not Go Gentle' for SATB (commissioned by the Da Capo Singers) and a major work for organ and 'cello titled 'Relentless' (commissioned by the City of Melbourne). Gavin Franklin is a jazz pianist and educator who is currently the coordinator of the Southwest College of TAFE's music industry skills course in Warrnambool, Victoria. He has written a treatise on the recorded improvisations of the American trumpeter, Woody Shaw. Inge Southcott was a medico for ten years before joining Opera Australia (full-time chorus and minor principal artist) until 1995. She teaches singing in Armidale. In 2010 she was awarded a MMus in vocal pedagogy from the University of Sydney. Her research was about how singers hear themselves and the use of recordings as a pedagogical tool. Malcolm Tattersall is a musician and writer who lives in Townsville, North Queensland, having moved north in 1990 after studying recorder and composition at Melbourne University and teaching in Melbourne schools for some years. He currently teaches recorder and other woodwinds and performs occasionally in chamber ensembles. He contributed to The Recorder, the de facto national journal for Early Music, from its first issue in 1984, later editing it and contributing too many other music journals. Mandy Stefanakis is Director of Music at Christ Church Grammar School in Melbourne. She has authored books and articles and continues to develop music curriculum. She is a Life Member of the Association of Music Educators (aMuse) and conducts interviews with contemporary musicians for the National Film and Sound Archive. Paul Draper is a professor of music technology and head of the Doctor of Musical Arts programme at the Queensland Conservatorium Griffith University in Brisbane. Peter Billam was born in London, and dropped out of a Physics PhD to play guitar. He moved to Switzerland in 1973 and Australia in 1983. Mostly he composes, but has also conducted and worked in theatre and as a record producer; he is also active as a programmer in the free-software movement. 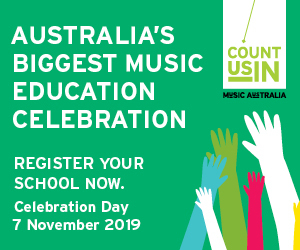 Dr Anita Collins is Assistant Professor of Music and Arts Education at the University of Canberra and has had a long association as a music teacher with Canberra Grammar School. Her research centres around the use of music education to enhance development and performance across a broad range of areas including nursing, management and leadership and boys education. Anita’s PhD research examined the new field of neuromusical research and how this research could be used to inform teaching practices and advocacy for the benefits of music education for children cognitive, emotional and social development. James Nightingale is a Sydney based saxophonist and President of the New Music Network. He holds a PhD from the University of Queensland and has worked as a professional freelance musician for more than twenty years. He is co-artistic director and alto saxophonist for Continuum Sax. Professor Warren Bebbington, Vice-Chancellor and President. A Fulbright Scholar, Professor Bebbington studied at the University of Melbourne and in New York at Queens College and Columbia University, completing masters degrees in Arts, Music, and Philosophy, and a PhD. He was a Deputy Vice-Chancellor at the University of Melbourne with prior academic roles at the University of Queensland the Australian National University. He has held national board/community positions on the Australia Council, Australian Music Examinations Board and Youth Music Australia and his publications include the Oxford Companion to Australian Music. Brisbane-based John Varney is a double bass graduate of St. Cecilia Conservatorium, Rome, Italy with a BSc in Applied Maths (Monash) and a PhD in Colombian music (Queensland Conservatorium). He has played in most of Australia’s major orchestras, Italy and Colombia, where he worked for six years. Currently active as a freelance double bassist, band-leader, composer, arranger and ethnomusicologist, he plays in various ensembles, being intensely involved in culturally diverse music for over 20 years. His teaching experience includes University of Southern Queensland, Queensland Conservatorium and various Brisbane private schools. He's currently working on a rhythm-concept project with TED-Ed. Steven Knopoff is an ethnomusicologist and composer who is Head of the undergraduate Musicology program at the Elder Conservatorium where he lectures in musicology and world musics, music theory, music in contemporary society and the history of popular music. His research and publication has focused on traditional music of the Yolngu people of Northeast Arnhem Land, and on the aesthetics and ethics of appropriating Indigenous song in contemporary forms of music. He is an editor for the Journal of Music Research Online and President of the South Australian Chapter of the Musicological Society of Australia. Peter Mousaferiadis is the founder of Cultural Infusion, an organisation that aims to facilitate intercultural contact through a range of sustainable arts and engagement programs aimed at building cultural harmony within communities and schools. Since 1988, Peter has had an extensive career in the arts as a creative director, producer, artistic director, music director, composer and intercultural facilitator. He has established himself as one of Australia’s leading cross-cultural directors. Andrew R. Brown is an educator, musician, digital artist, and computer programmer. He holds a Ph.D. in Music and is Professor of Digital Arts at Griffith University, in Brisbane, Australia. His forthcoming book Music Technology and Education: Amplifying Musicality will be published by Routledge, New York, later this year. Aleksandra Acker is lecturer at RMIT University in Music Education, Language and Literacy and Inclusive Education. She is a singer with a lifelong interaction with different music genres. Her ensemble 'Anja & Zlatna' explores different languages and is preparing their debut CD. Influenced by programmes of Reggio Emilia she wants to see music as an integral part of mainstream curriculum, treated as one of the languages of childhood. Internationally known as a researcher, Aleksandra is co-writing a book on young children and music with her long term research. Mary Jo Capps has worked in the Australian cultural industry for more than 30 years after graduating with an MA in Musicology from the University of Toronto. In 1999 she was appointed CEO of Musica Viva Australia, where she continues to advance chamber music and music education internationally. In 2010, Mary Jo became the first female President of the Sydney Business Chamber since it was founded in 1825. She is currently Chair of the Advisory Board of the Faculty of the VCA and Melbourne Conservatorium of Music, University of Melbourne, a Board Director of the Community Council of Australia, Green Music Australia and of the Peggy Glanville Hicks Trust, and a Council member of the Centre for Social Impact. She works as a professional mentor and is actively engaged in supporting emerging talent, particularly in arts administration. Justin Macdonnell has worked in arts producing and consultancy for over 40 years. He has been General Manager, State Opera SA, Director, National Opera of New Zealand, Program Director, Sydney Festival, Executive Director, Confederation of Australian Professional Performing Arts and Artistic Director, Miami Center for the Performing Arts, USA. As principal of Macdonnell Promotions he was for 20 years one of Australia’s leading arts consultants in the public and private sectors and to scores of arts organizations in Australia and abroad. He has written two major books on arts policy and history. He is now Executive Director of the Anzarts Institute a consulting agency in the cultural industries. Philip trained in Australia and Europe as a classical musician but left music in his late 20s to work as a manager. For the past 15 years he has found his purpose as the owner and director of a strategic advisory consulting firm. He runs The Marais Project and Sounds Baroque with his wife, viola da gambist Jennifer Eriksson. One of Sydney’s most in demand Saxophonist, Matt Keegan regularly performs throughout Australia and around the world. He appears on over 50 albums, is a featured soloist for many well-known groups both past and present and has performed at music festivals across the globe. In 2011, Keegan won the prestigious MCA Freedman Fellowship for jazz and has subsequently produced a recording with his new group The Three Seas in New Delhi, India. In professional capacity Keegan has also played, recorded and or toured with groups including the Darren Percival band, James Muller Band, The World According to James, Phil Slater’s Sun Songbook, The Beautiful Girls, Jackie Orszaczky, Thirsty Merc, The Japan Australia Jazz Orchestra (JPN) and Maroon 5 (USA). Gillian Howell is a musician, educator, and researcher. She is a PhD candidate at Queensland Conservatorium Griffith University where her research investigates participatory music initiatives in conflict-affected settings, with earlier studies in refugee children’s perceptions of music participation, and cross-cultural music leadership. She lectures in Community Music Leadership at Melbourne Polytechnic. Gillian has a diverse practice as a devisor and leader of participatory music events, with frequent invitations to work with orchestras, festivals, and arts organisations throughout Australia, and extended residencies as an arts facilitator in multiple post-conflict and developing countries. She is the former Creative Director of Melbourne Symphony Orchestra’s award-winning Community Engagement program. Vanessa Hutley BA (Hons) LLB Graduate Diploma Education General Manager Music Rights Australia. Vanessa Hutley has worked as a lawyer in the creative industries for over a decade. She has been responsible for the development of intellectual property protection programs in Australia, New Zealand and the South Asia Pacific region. Vanessa is the General Manager of Music Rights Australia which represents both Independent and major record labels and songwriters and music publishers. Vanessa is responsible for overseeing Music Rights Australia’s education, advocacy and protection programs. Dean Ormston is a senior Australian Music industry executive and is head of APRA AMCOS Member Services Group AMCOS where he oversees Membership, Distribution, International, Communications and Government Relations portfolios. Ormston is an active advocate to Government for the recognition and support of creator's rights, and has secured government support for export office Sounds Australia, the National Live Music Office, school song-writing residencies, and international songwriting collaborations. Ormston has initiated economic research projects into the venue-based live music industry and the potential application of tax-offsets to the commercial music industry. Ormston is a Board Director of Screenrights, and in a former life was a high school music teacher. Paul Mason has been the Director of Music at the Australia Council since 2009. During this time he has overseen the creation of a range of programs including the Nashville Songwriter residency, targeted funding for record labels and a range of partnerships with industry organisations such as APRA and the PPCA. Prior to the Australia Council he worked in broadcasting, with both the ABC and the community broadcasting association where he established the Amrap initiative. He’s also held board positions with Music Australia (then MCA), FBi 94.5 and MusicNSW. Stuart has been working in the music industry for 20 years and brings with him a diverse collection of experiences. His previous roles vary broadly from CEO of Australian Independent Record Labels Association, running the Queensland Music Network, serving on the Worldwide Independent Network and holding a position on the International Honorary Committee at MIDEM for five years. He is also currently the Director of Licensing & Business Affairs for Nightlife Music, serves on the Q Music Board of Directors, is on the Steering Committee for BIGSOUND and consults to AIR as their Industry Advocacy and Government Relations Spokesperson. Scott has been working in the WA music industry for over 20 years as an educator, label manager, artist manager, tour manager, booking agent, project manager, arts organisation administrator and occasional music writer. Scott started WA's first music business qualification at the Central Institute of Technology’s Centre for Music Industry Training (CMIT), where he coordinates a team of four music business lecturers, and has established student internship and placement programs and extensive industry partnerships. Previously Scott headed up Qstik Records & Management, providing distribution, marketing and touring networks for WA artists including successful WA act The Panda Band. John Wardle: has a background in live music policy across the three tiers of government and is a working musician and music teacher. John has played a strategic role in liquor law reforms across a number of states, including changes to the NSW Place of Public Entertainment (PoPE) laws and the NSW Building Code of Australia.In 2013, John was appointed Chair of the City of Sydney’s Live Music and Performance Taskforce and joined the Live Music Office as it was established in July 2013. John works closely with state and local governments across Australia to develop live music policy for built environment and cultural policy frameworks. Damian Cunningham: has more than twelve years’ experience in the Australian live music industry. He has worked as a booking agent, tour manager and in logistics for artists and festivals including the Big Day Out, Splendour in the Grass, Peats Ridge, Surry Hills Festival and the Newtown Festival. He also runs his own live music services company Elastic Entertainment. Over the years, he has handled tour support for Lorde, The Griswolds, Jon Cleary and The Good Lovelies. James Koehne was Music and Dance Executive with the Victorian Ministry for the Arts for eight years, and as Policy Adviser with ABC Concerts, he managed the process of the corporatisation of the six symphony orchestras. He has worked extensively as a music administrator and programmer, and was Music Adviser to Clifford Hocking’s 1990 Adelaide Festival. From 1997 to 2010, he was Director of Artistic Planning of the Adelaide Symphony Orchestra, and is currently a Lecturer in Music History at the Elder Conservatorium, and a freelance consultant and writer. Jeremy is an Instrumental Music Teacher at various State secondary schools in metropolitan Melbourne where he is a Strings specialist. In contrast, he is also heavily involved in the community band scene having been involved in bands for over twenty-five years, and has performed with bands across Melbourne, regional Victoria and southern NSW. Jeremy is currently a Life Member of the Southern Area Concert Band and a member of the Stonnington City Brass band where he is a percussionist. He has been the Music Australia Councillor for Brass and Concert Bands since 2012, and is currently a member of the Victorian Bands’ League Executive Council. Jeremy holds a Bachelor of Music, Graduate Diploma in Education (Secondary) and a Master of Education (Arts Admin.). Margie Moore has extensive experience as an arts, education and music educator and administrator. She has had successful careers as a teacher, music consultant, lecturer in arts education and managing the highly regarded Sydney Symphony Education Program. Most recently she has worked for the Australia Council for the Arts, The Australian Chamber Orchestra, Moorambilla Voices, Musica Viva, Music Australia, the NSW Department of Education and Training, Symphony Services International, Sydney Opera House, the University of Technology Sydney and Warhorse Australia. Margie has been a member of and actively involved with the NSW and National Orff Schulwerk Associations since the early eighties and has held executive positions at both state and national levels. In January 2011 Margie was awarded an Order of Australia Medal for her services to Arts through Music Education. Richard Letts AM was the founder of Music Australia. He directed music centres in the USA, the Music Board of the Australia Council, Australian Music Centre and now The Music Trust. In 2005-09, he was President of the International Music Council. He is an author, researcher, editor, advocate, musician. Aoife has over ten years’ arts marketing and administration experience, having worked with leading Irish and international cultural organisations including Dublin Theatre Festival, the Bord Gáis Energy Theatre, Canadian Stage (Toronto, ON) and the Abbey Theatre. Aoife’s previous roles have spanned the fields of marketing, publicity, audience development, digital media management and communications. She is a current member of the Campaigns committee for the National Campaign for the Arts, as well as a qualified drama teacher, aspiring piano player and lover of music of all genres. Stephen Cassidy is a cultural researcher, writer and commentator who has worked across the Australian cultural sector for 40 years. This has spanned policy, programs and research in government, museums, publishing, community radio and community arts in four states and territories at national, state and local level. It has encompassed creative industries – including contemporary music and literature, Indigenous culture and languages, and intangible cultural heritage. He was Director of the National Cultural Policy Task Force, wrote the proposal that initiated the Digital Content Industry Action Agenda, drafted the Indigenous Contemporary Music Action Plan and played an instrumental role in the adoption of Australia’s first National Indigenous Languages Policy. He has been a Community Arts Officer in local government, Arts Officer for the ACTU, Development Manager at community radio 2SER-FM and Membership Manager for the Powerhouse Museum. He is an Adjunct at the University of Canberra and is a member of the Management Committee of Craft ACT. He blogs at indefinite article and is on Facebook and Twitter. For over twenty years, Ruth Hazleton has been active in the independent, folk and traditional sectors of the Australian music industry; as a multi award-winning singer and instrumentalist (touring nationally and internationally), as an agent for international touring artists and in event management. She is also an arts advocate and activist. In late 2016, Ruth initiated the #saveRNmusic campaign to protest cuts to ABC Radio National music programming. A folklorist by trade, Ruth is also a blogger and currently works for The National Library of Australia.